There are 89 posts in this topic. You are on page 2 of 2. Woke up this morning to discover the worst has been avoided. 2/3 of the roof and framing is gone, and so is the spire. But the facade is intact. This spire was a very thin tower (300 ft height) which was a late addition during a major renovation (1844-1864). Here is a view taken this morning (not by me!). Are you serious right now? He wouldn't say it, but I will...the idiot that suggested dumping tons of water from planes was Trump. Clearly, someone with actual legitimate firefighting and architecture experience, as no doubt you have as well. 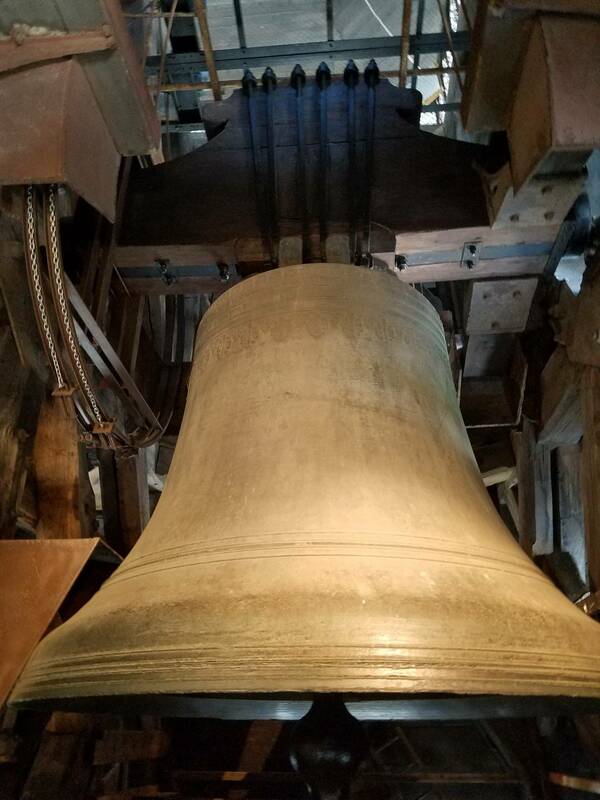 It has nothing to do with bandwagoning, it has to do with not being a moron and crushing an 800 year old structure under the weight and impact of the water. Nobody was saying ANYTHING about fire retardant chemicals. You do realize they have more than just water to dump from aerial vehicles? I didn’t realize that you were the resident firefighting engineer with intimate knowledge of medieval structures! 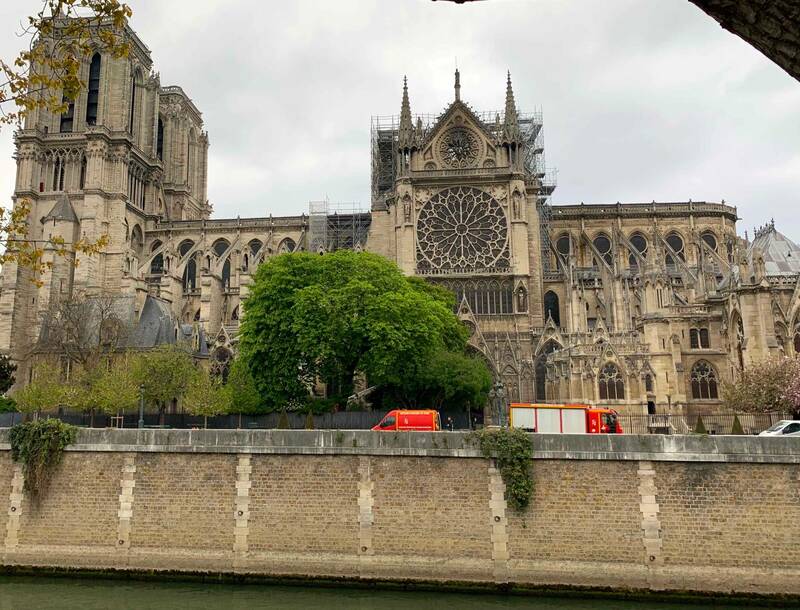 I’m glad that Notre Dame was able to survive the fire, imagines coming from the inside seem to suggest that the vaulted stone ceiling may have been a saving grace. 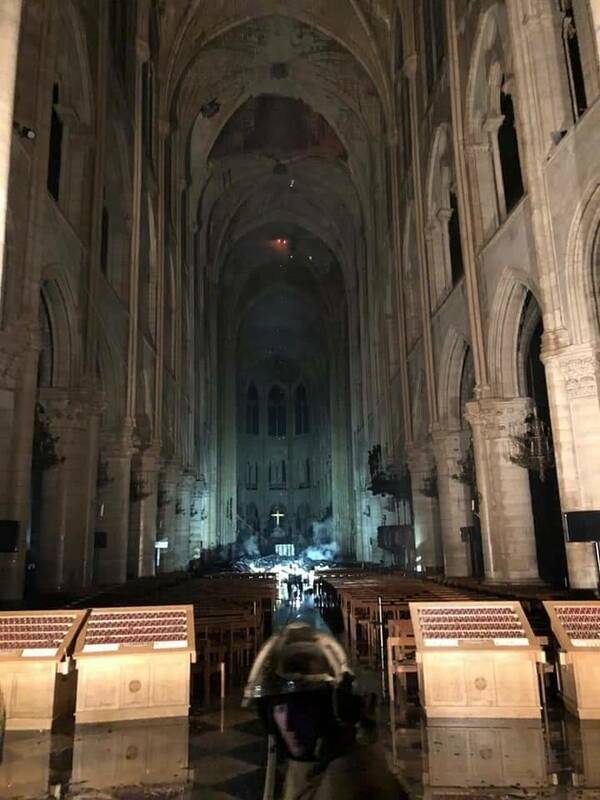 The collapse of the spire did punch a hole through the ceiling and nearly took out the alter, but aside from extensive water damage, the interior seems to have been spared after all. We’ll see as more reports come out. 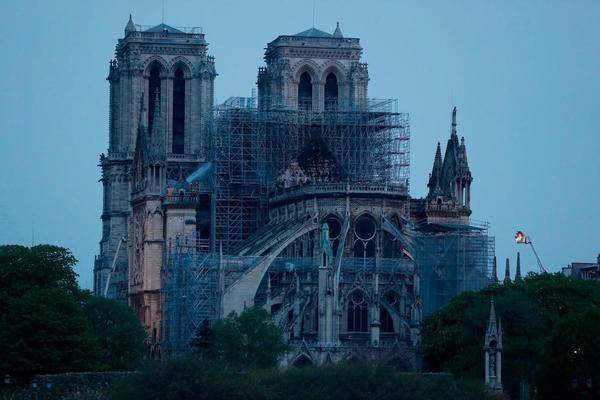 The roof will be rebuilt, although it will take some time. I’m really interested in the stained glass windows. I wonder if they survived the fire and heat. Those windows might be hard to replace if they’re destroyed. I’m not religious at all. But I really don’t like monuments being destroyed. This building was an architectural masterpiece that I hope will be fully restored to its former beauty. world wars. Perhaps the best example of flying butresses anywhere. I've been there many times. So much history lost. Hopefully the outer structures are still sound physically. It is amazing how good it looks from the pictures that are coming out considering how intense the fire was yesterday. Perhaps when they rebuild they can use steel beams and put in sprinkler systems now that they have the opportunity to modernize the less aesthetic portions of the building. 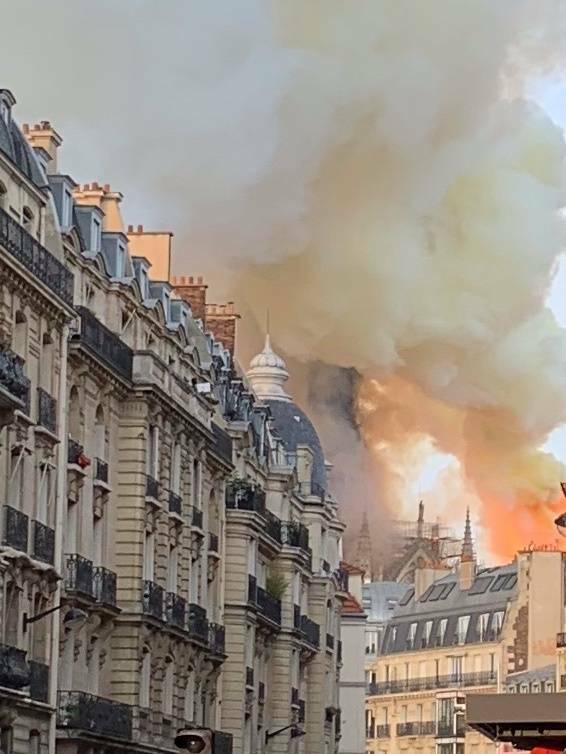 Small miracles- most the building is intact, 3-5 minor injuries to first responders (was worried about staff trying to save stuff), some major relics removed, bronze statues on spire removed last week, some stained glass survives on west and north end, unesco setting up fund at world bank. 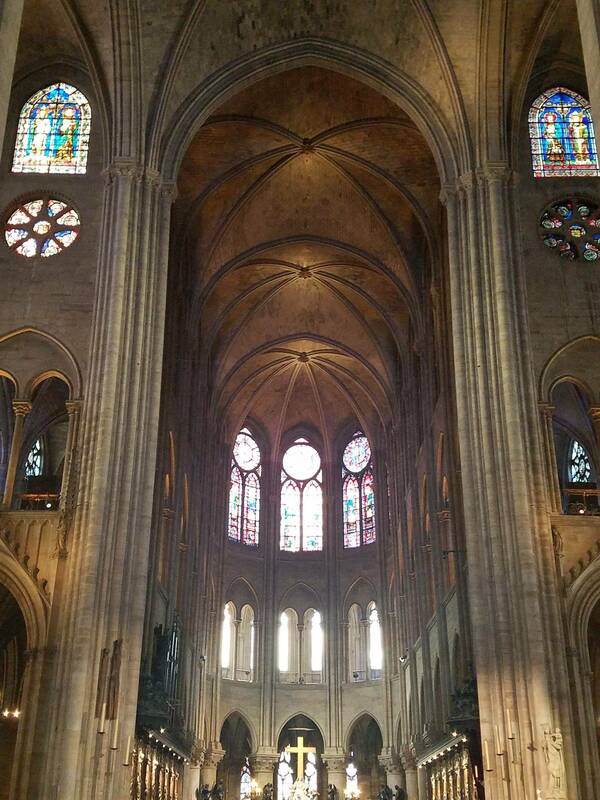 The 4 main pillars appear to be standing at the center! This could have been so much worse. Still a sucker punch to my gut to see history burn. It will be rebuilt! Very happy to see how much survived! 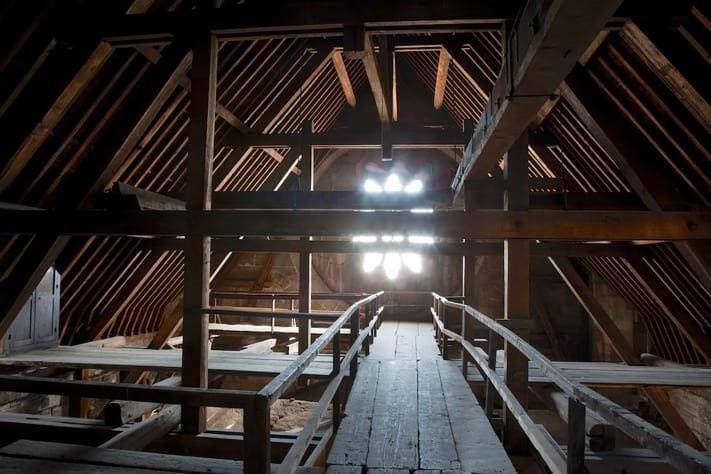 It's going to be impossible to rebuild it to its original state unfortunately, the wood that burnt down came from France primary forest, oak trees that were 400 years old and cut around 1100, each beam was cut from a single tree. These type of trees don't exist anymore, that loss is tragic. Today’s wood is much more susceptible to dimpling. That one was funny, I must admit! He's right though. Old growth lumber is far superior to what will be able to be sourced in modern times. They planted replacement trees that last time it was damaged they are 160 years old now. 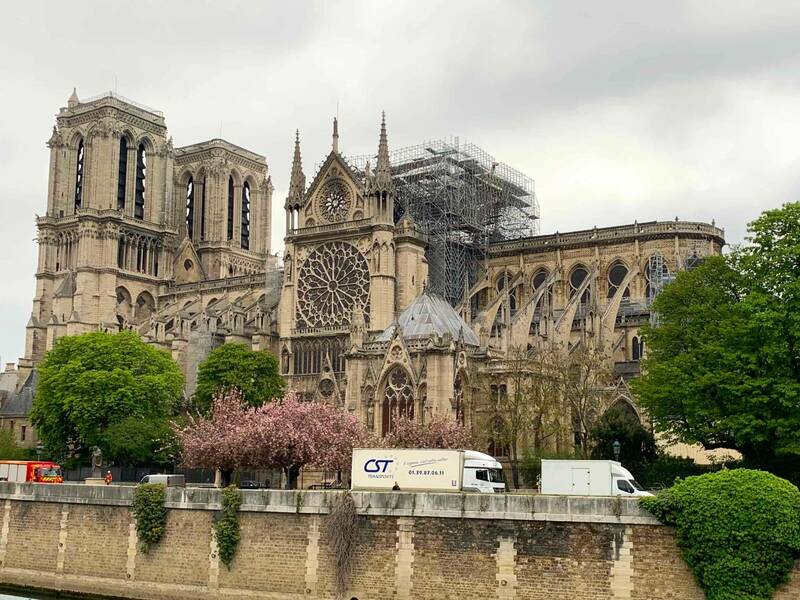 The information I mentioned above comes from the VP of the "Fondation du Patrimoine", the government agency responsible for France's historical sites preservation and restoration. 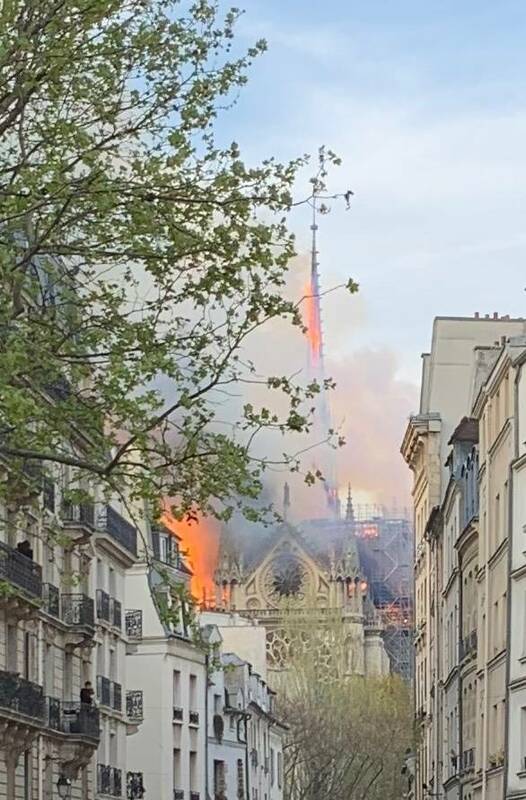 The damage you are referring to did not affect the frame of the Cathedral, that remained untouched since it's early construction. They should use way less wood next time. 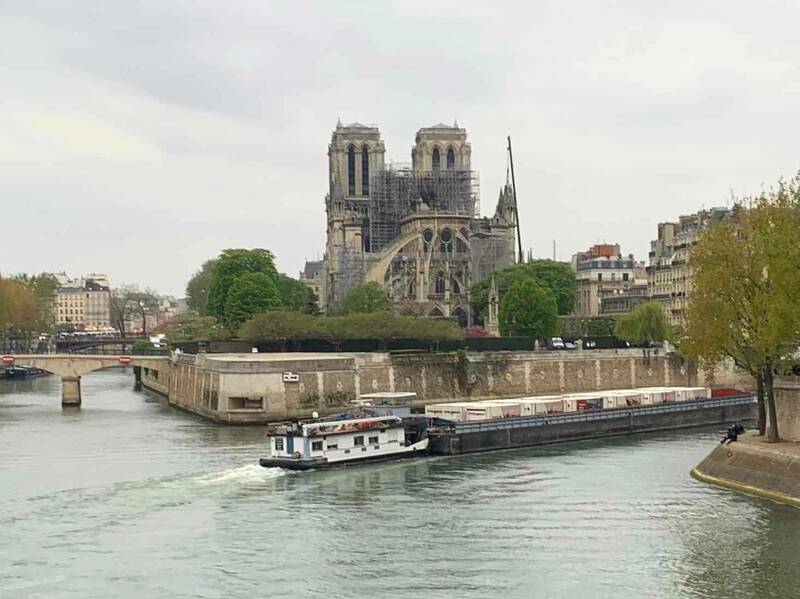 Would Notre Dame have survived 2 civil wars, the French revolution and 2 world wars with less wood ? Not sure I would bet on that ! I'm not referring to any damage. Just posting some information I saw. I doubt they would make it out of wood anyway, there are just so many better materials. All they need is enough wood for veneer. The trees may not be available in France but the building was hardly in its original state. It will get rebuilt to look similar but it will be take advantage of modern construction. Pictures I took yesterday evening, roughly 24h after the fire. Our Old Lady is tough! 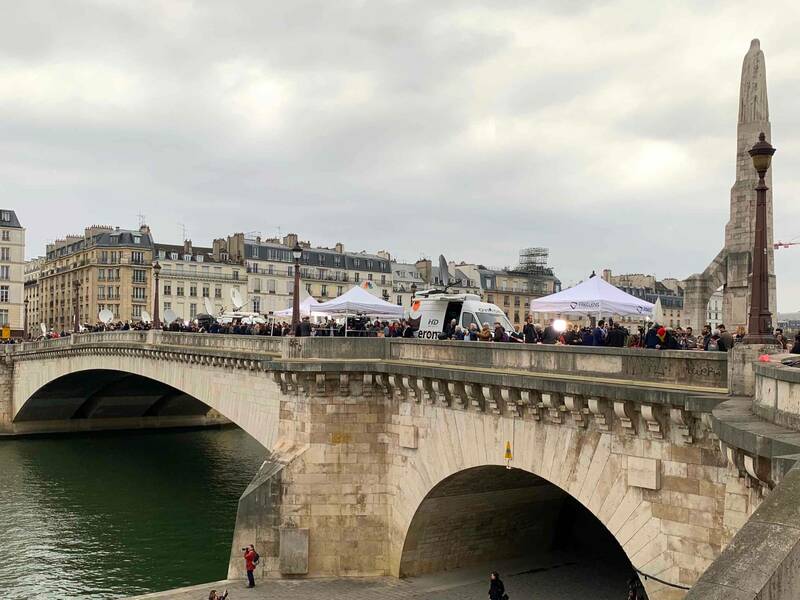 The bridge nearby was packed with journalists. Wow, that could have been so much worse. The stone ceiling saved the majority of the structure. 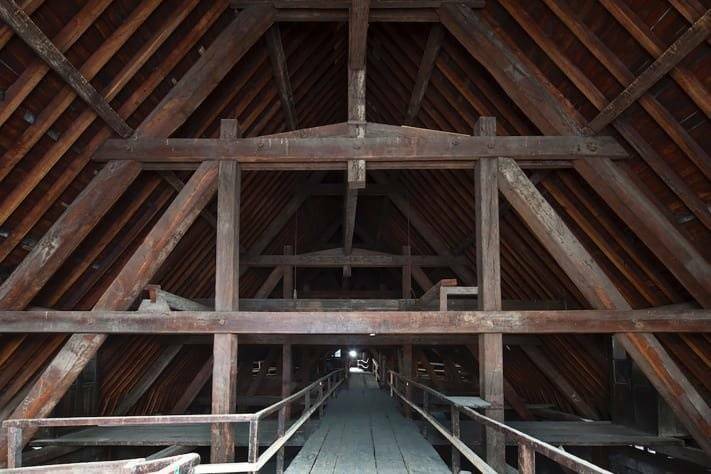 While from a historical perspective, it may not be considered proper, I would hope that when they do rebuild the roof section, maybe not do it entirely out of wood? Perhaps light frame steel internally, with a external wood sheathing? These are the kinds of arguments Engineers get into with Historical Architects...... Most of the time I lost. More money came in, there is almost 1 billion euro pledged so far. 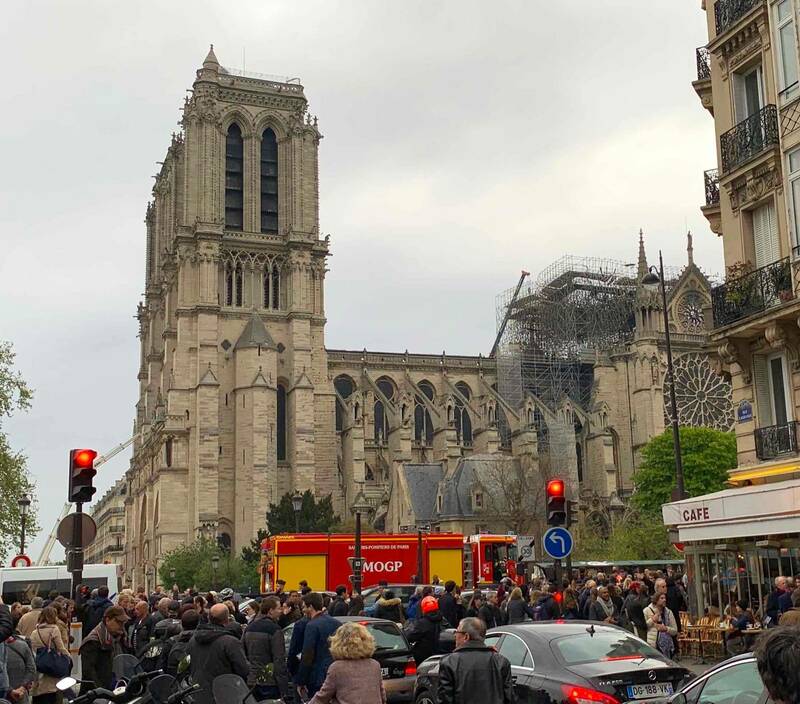 And as always in France, it raised a major controversy where donors are accused of not pledging to other causes that are viewed as more important than Notre Dame. This is so good to see and hear. She is one tough old girl. Also good to hear that the damage was not a total loss. Many things survived, just going to need a good deep clean. But there is still tons of work to be done. Monday night was so awful watching it burn, it seemed at some point all would be lost. Certainly new percautions and modern systems implemented, heat sensors, cameras and sprinklers will be on list. Yes, the attic and catwalks are lost. However new modern framing will help the long term survival of the structure. They have no choice now. The stone damage at ceiling where spire toppled through can be fixed and much of backed with a resin seal it would seem. The pictures coming out today are just so hopeful. Those were my first thoughts...Catholic Church is sitting on 30 billion. They can pay for it. If donors have a billion to give to a "thing", imagine if they gave that toward charities and causes that actually help PEOPLE who are suffering in the world today. We need some donors like that here so we can build the wall!!!!!!!!!!!!! Yeah you took this and went the wrong direction with it. This is so sad to see! 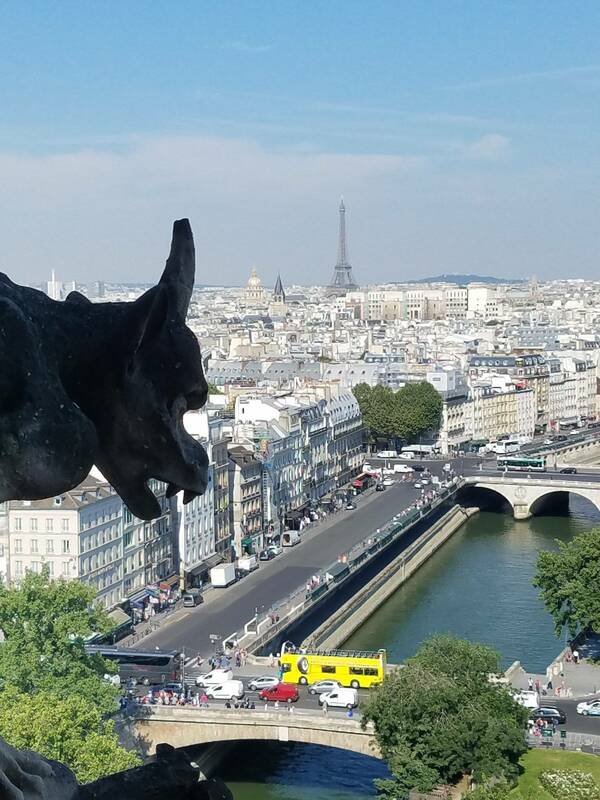 We are going to Italy and France in June/July and this was on the list to go to in Paris. Really aweful and hopefully it can be rebuilt like they are saying. The building is owned by France. The Catholic Church has been and will be forever allowed to use it, as long as they do not charge an entrance fee. According to an ancient agreement. That was stated by a government official, the next day after the fire. I would guess that there are donation boxes inside. Oh! and for 2 Euros you can get a candle lit from any where in the world. Good idea ! Why don’t you start showing the exemple, sell your pinballs and give it all to help PEOPLE who are suffering in the world today. This post was moderated 2 days ago: Pinside rule #1: Be nice! Always takes about 2 seconds for personal attacks and false equivalency in the modern discourse. I’m not sitting on 30 billion, nor do I have the power or influence of running a major world religion. You’re making people suffer by existing. Go away. Moderation notice: please keep this thread is kept away from politics and religion. It may seem odd, but this Church is the symbol (with the Eiffel Tower) of Paris even for non-believers. So we (count me in) are all affected. This is not the right place to argue about who should pay. In any case, over $1billion has already been collected. The problem might not be money, but lack of skilled workers, and some really hard technical choices to make (wood frame? Steel? Concrete? Type of Spire?). In any case, while it won't be open to public for a long time, the Old Lady is still here to stay. And it still looks beautiful despite its scars. 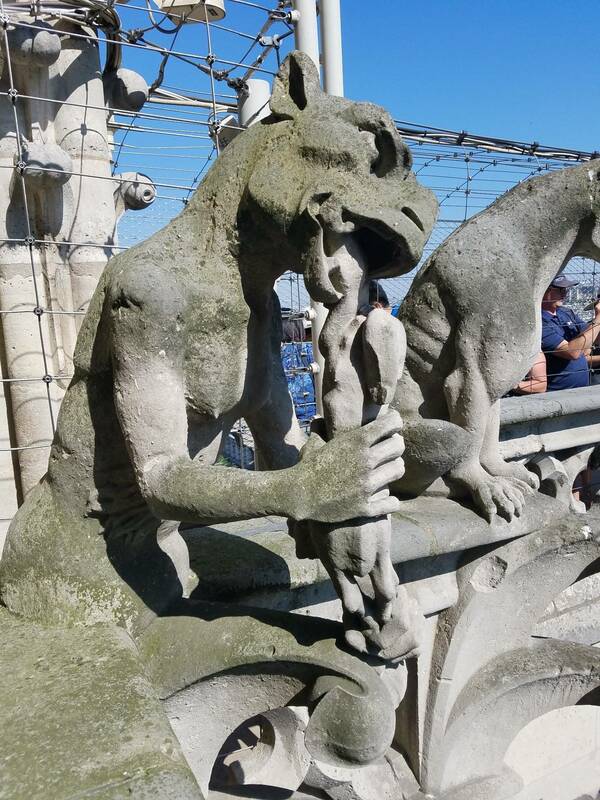 Anybody know if the hunchback got out OK? How long do you think it will be before there are reports on how the money raised was mishandled and allocated to other things? It's a sad state of affairs but this much money being raised is probably not a good thing! Like our homeless, returning Vets and children up for adoption. Let me rephrase in a better way then. The fact that these rich donors give for Notre Dame does not mean they don't give money to other causes. 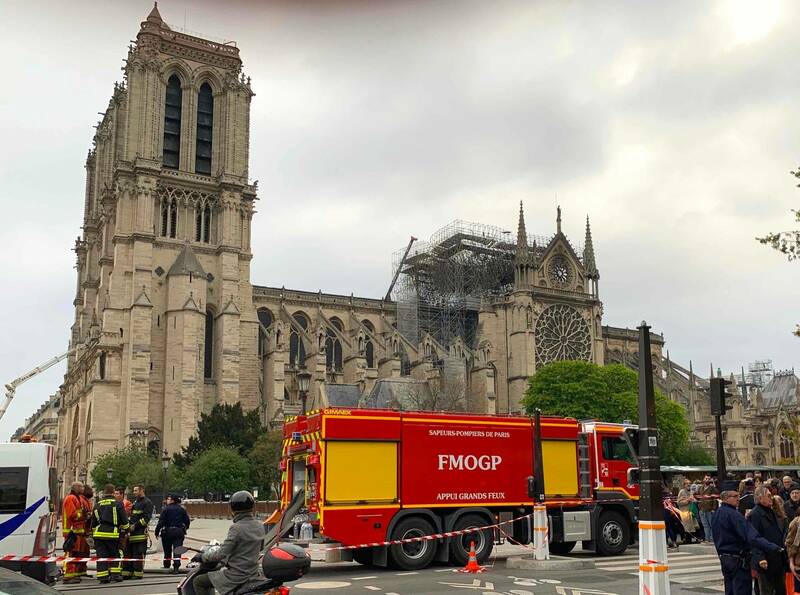 For exemple L'Oreal who pledged 200 millions to Notre Dame accounts for 40% of the total national donations to charities in France. They have a Foundation that gets 500 million a year plus another 30 million from the Heiress personal fortune. So yes I do find it wrong to oppose generosities and blame donors for it. That takes knowledge outside social media. People form their opinions these days based on memes. I do admit the humor in outrage without a clue culture is a guilty pleasure.